Advising the Elderly or Disabled Client, Second Edition expedites research, providing specific answers and solutions to legal and practical questions and problems that arise in daily practice when representing elderly or disabled clients. This resource offers coverage of an extremely sensitive area, giving you step-by-step guidance to remain on solid ground in a complex legal or financial scenario. Authors Lawrence A. Frolik, of the University of Pittsburgh School of Law, and Melissa C. Brown, an attorney with the Sacramento law firm of Farrell, Fraulob & Brown, provide expert coverage across the full range of elderly or disabled client concerns, including: planning for Medicare, Medicaid, and private insurance; medical decision-making and right-to-die issues; retirement and disability income planning; acute, chronic or changing medical conditions such as AIDS, Alzheimer's, strokes and mental illness. 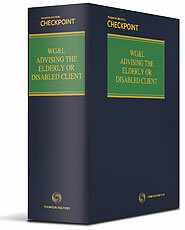 There is even a chapter on evaluated residences and special accommodations for the disabled or elderly client. Includes scores of practice aids such as official forms, model documents, detailed real-world examples, checklists for interviewing and planning, and a quick-reference glossary of technical terms, concepts, and acronyms. Appendix 5-6. POM Sections: Transfer of Resources for Less Than Fair Market ValuePOM Sections 01150.005–01150.010, Transmittal No. 13, SSA Pub. No.69-0501150 (Sept. 2000). Appendix 5-8. SSA POMs: Special Needs TrustsEmergency Message EM-00067 (May 26, 2000). Appendix 7-15. Social Security Model Fee AgreementSource: Social Security Administration.